There are only two church or former church buildings like this one in North America, and perhaps fewer than 15 with a central ceiling dome and no supporting columns. See why this heritage building, designed in 1897, is designated as a “round church”. Two thousand people attended the laying of this corner stone in 1898. Burned to the ground in 1917; rebuild in 1918 to the same plans. 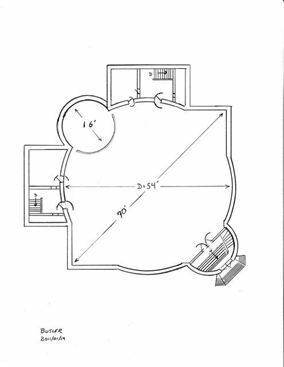 How to build a round church: A circle within a square, and circles on opposite diagonals and a dome in the middle. Mary Webb Gosnell and her five children came from Ireland in 1832 and settled just down the road from what is now Highgate, carving a farm out of the thick forest. The first Orford church services were held in her log cabin in 1834. A round basement too, based on the “Akron Model” of the 1870s, with Sunday School rooms around the exterior and common meeting/reception/assembly/multi-use area in the centre. The future use will stay much the same, with the small rooms becoming art galleries and spaces for historical displays. Documents from Ontario Heritage Trust. 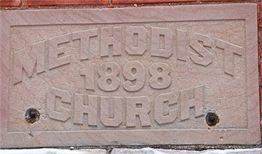 Highgate United Church is historically significant for its association with the growth of the Methodist Church in Ontario and for its association with individuals of local significance, most notably members of the Gosnell family and the Rev. T .T George. The Highgate United Church congregation dates to 1834. The current church, constructed in 1917-1918 is the seventh building the congregation has held services in throughout its 176 year history. 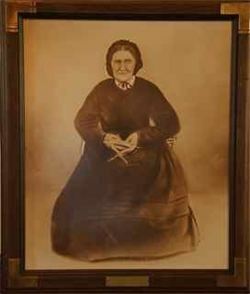 In the summer of 1834, Mary Webb Gosnell invited members of the community into her home for a church service conducted by Rev. Stephen Miles, a Methodist circuit preacher. These small gatherings in Mary’s home became an established congregation in the Methodist Episcopal Church of Canada. The new congregation was part of the Kent County Circuit. When the congregation became too large to worship in Mary Gosnell’s home, services were held in a local schoolhouse. In 1849 a small frame church was constructed on the grounds of the local cemetery on land donated by Joseph and George Gosnell, Mary’s two sons. The first pastor of the church was Rev. John McLean. In 1861 a larger church was constructed on the same site by contractor Andrew Tolmie with local volunteers assisting with the construction. The new church was called The Centenary Church and had a resident pastor, Rev. M.A Wright. During this same time period, a number of the congregation felt The Centenary Church was too far from their homes and began holding services at Hornal’s Schoolhouse. In 1879, Thomas Lee donated land for the construction of a new place of worship, Lee’s Church. Centenary Church and Lee’s Church were a two point charge until Lee’s Church closed in 1969. In 1870 a new frame church was built in the village of Highgate on the site of the present church. The old 1861 Centenary Church continued to hold services, but was soon sold and moved to Orford Township and used as the Township Hall. In 1897 the Rev. T.T. George drew up plans for a new, larger church. The cornerstone was laid on June 22, 1898. The new church was dedicated on December 18, 1898. In March 1917, this church burned to the ground. It was decided that the new church be constructed to the same plans as the previous church. It was completed in September 1918. In 1925, the Methodist congregation voted to join the newly formed United Church of Canada. Over the years, the congregation of Highgate United Church declined and the final service was held in June 2010. At that time, a group of East Kent residents came together to transform the Highgate United Church into a cultural and community centre, both as a means of preserving a much loved heritage building and as a way of fostering the continuing life and growth of its community. Hence, The Mary Webb Cultural and Community Centre was formed. The planning began to make the dream of revitalizing the former 100 year old United Church. 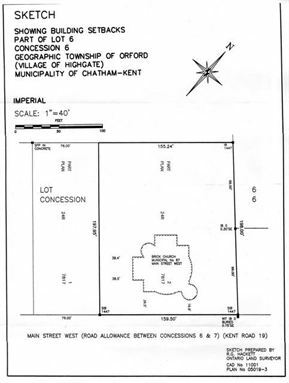 Our business plan was to make a performance centre, art gallery, social hub, and reception hall for the community of Chatham-Kent. The Board recognized that an extension to the existing building was imperative to meet the accessibility requirements and the concept and design for the addition began. Since 2010, monies have been raised to make numerous upgrades and repairs to the MWC, to maintain and improve the Heritage building and to bring the original building up to fire and safety codes. Many improvements and upgrades have taken place in those 8 years – a new roof, restored stained glass windows, front porch, furnaces and air conditioning, upgraded power supply, refurbished front doors, fire doors, alarm system, smoke and heat detectors, innumerable touch ups as well as performance items as a state of the art light and sound system, reconstructed stage, stage curtains and carpeting! All of this accomplished through grants, donations and volunteer efforts. In September 2016, we turned the sod and the expansion began with a $250,000 Grant from the Canadian Heritage Department and our own $100,000. The $800,000 addition is now completed and provides accessibility to all. We continue to fundraise, in every way, shape and form including generous local donations and fund raising efforts.